Fitness Reality. Real people. Real results. 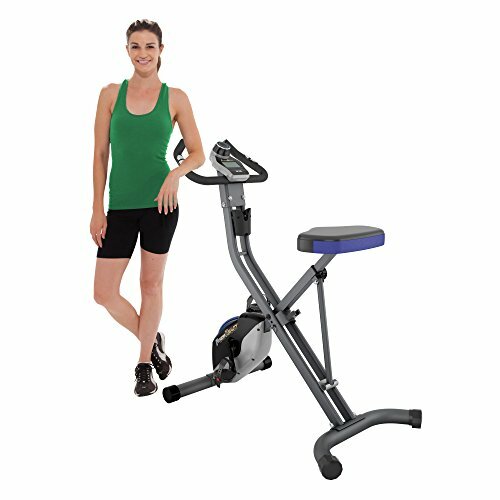 The Fitness Reality U2500 is designed to support up to a weight capacity of 400 lbs. It is built for long life and durability. Features like the "high torque" 3 piece crank system, magnetic resistance, heart pulse monitoring and a "double drive" transmission system are all included for a very affordable price. It can be folded away when not in use making the U2500 excellent for limited sized rooms and spaces. Additional features: very easy to get on and off the bike, providing a more effective and comfortable workout. Heavy duty and high durability steel frame construction with up to 400 lbs weight capacity. 20% more steel than the exerpeutic magnetic upright bike for more maximum performance. Extended leg stabilizers to prevent any movement or tipping when exercising. An 8 level magnetic tension control system for an easier or more challenging workout. An easy to read large computer LCD display that indicates calories burned, distance, time, speed, scan, odometer and pulse. Heart pulse sensors allow you to monitor your heart rate. 3 piece "high torque" cranking system provides a smooth and consistent pedaling motion. Large comfortable seat cushion for people of any size, and easily adjustable to fit 5'1" to 6'5" user heights. Larger pedal design with safety strap prevents any foot slippage when exercising. The precision balanced flywheel and V- belt drive provide a smooth and quiet operation and will not interfere with watching TV or listening to music. Folds to 1/2 the size, so it is uniquely compact. Folded dimensions: 26.4" L x 24.8" W x 57.5" h. Transportation wheels included for easy relocation. Accessory holder included. All batteries included (2 AA). some Assembly required. Setup dimensions: 39" L x 26.4" W x 48.4" h. Setup weight: 50.7 lbs. 1 year limited warranty.